Guten Tag! 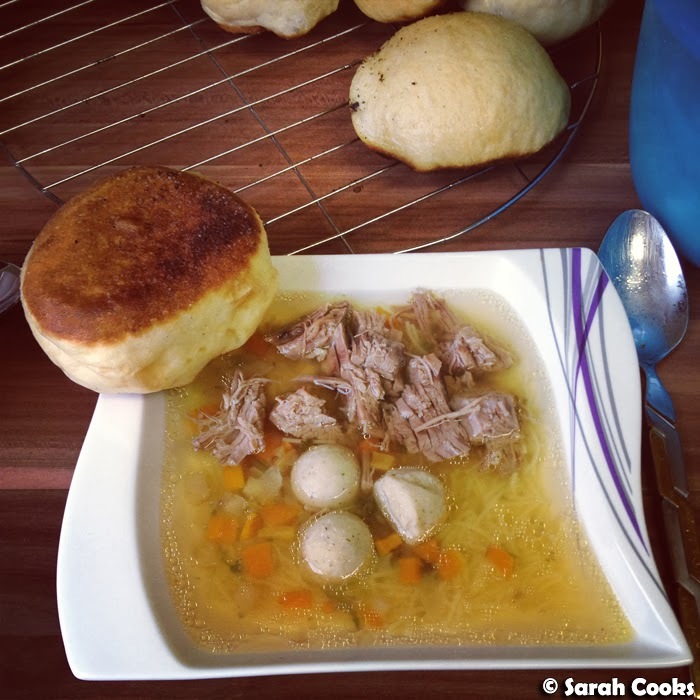 I'm very excited to be sharing a German recipe with you today! 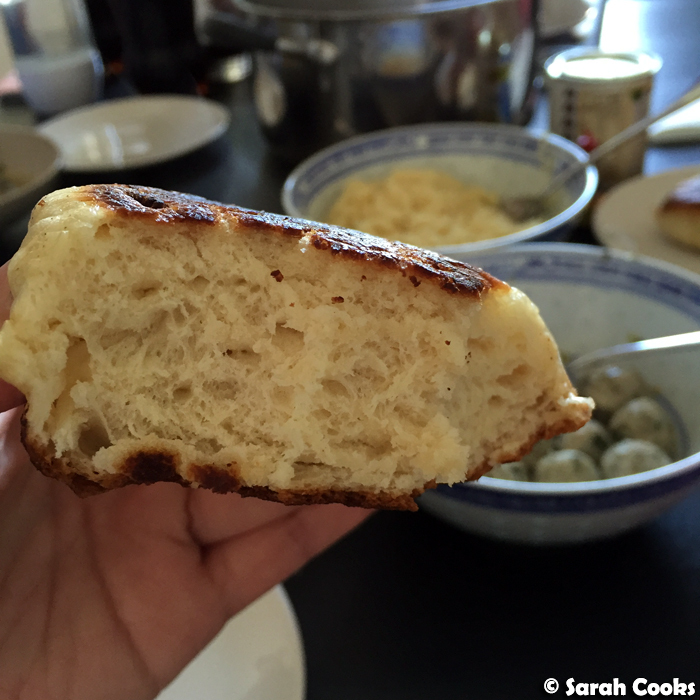 Dampfnudeln are literally "steamed noodles", and are basically a plain yeasted dough, that you half-fry, half-steam (like potsticker dumplings), until they develop a salty crust. Made savoury like this, they're usually served with clear soup (think: chicken soup or beef bone broth). 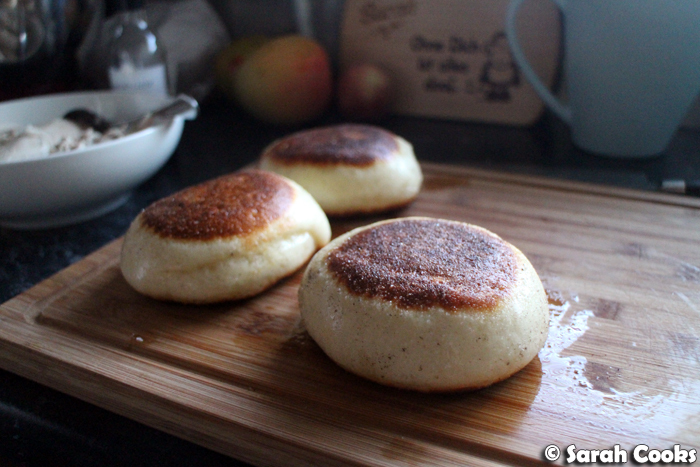 They're fluffy fluffy pillows of salty crunchy carby deliciousness! Sandra's mum usually makes them for us when we're in Germany (see Germany 2015: Homecooked Meals, and Germany 2013: Snapshots), and I've made them a couple of times at home. (I've even made a sweet version, Germ Knödel, filled with plum jam and topped with custard for an Austrian lunch party we hosted). Oh, lecker! Another lunch in Germany, this time in August 2015! Now, let me show you how to make them! 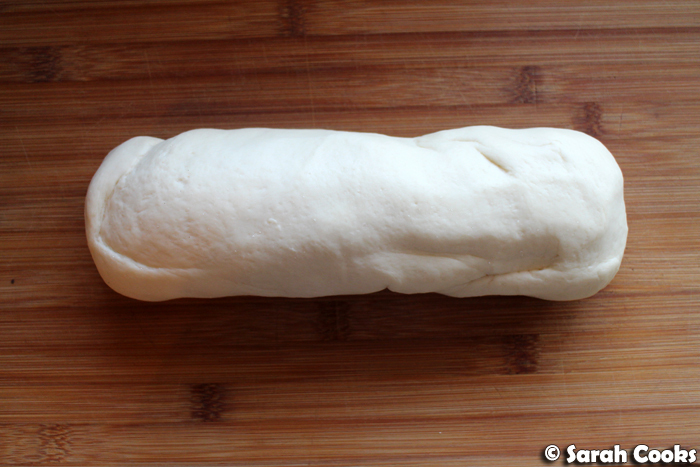 Here's the dough - just flour, salt, yeast and milk. I love how soft and springy it is! 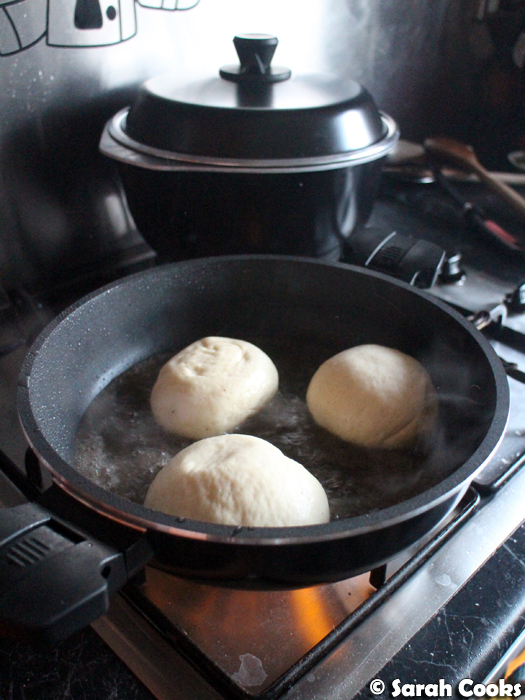 To cook the salt-crusted Dampfnudeln, you'll need a heavy-based non-stick deep frypan with a tight-fitting lid. 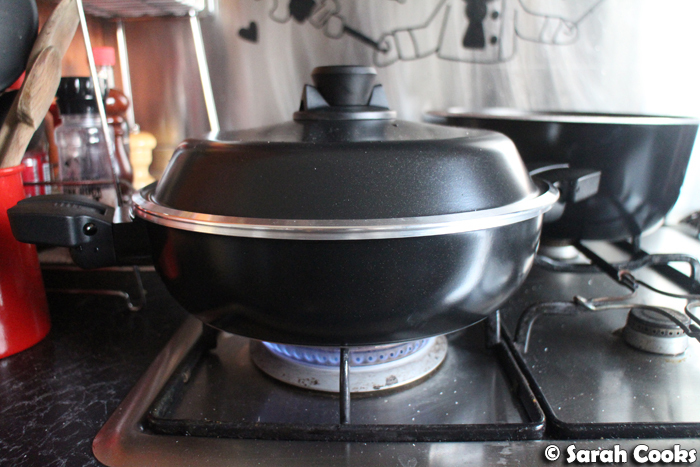 I recently got sent some pots and pans from Bessemer for review, and thought that their 28 cm Multi Pan would be just perfect for Dampfnudeln. 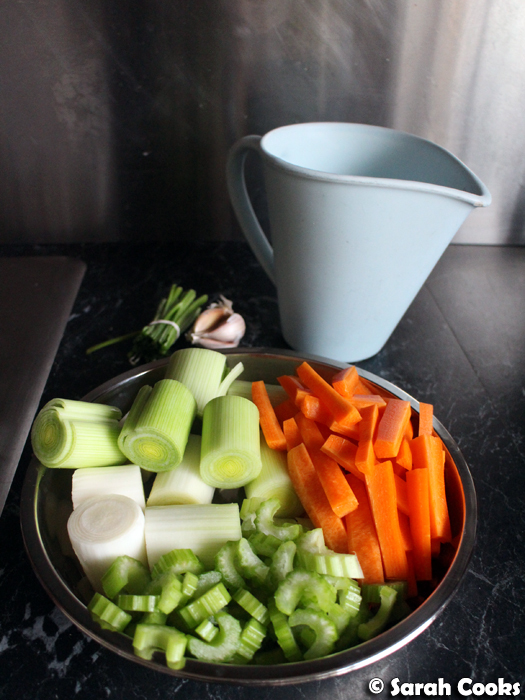 (I also used the 5.0 litre Country Kitchen Casserole to make the soup). So, the soup. 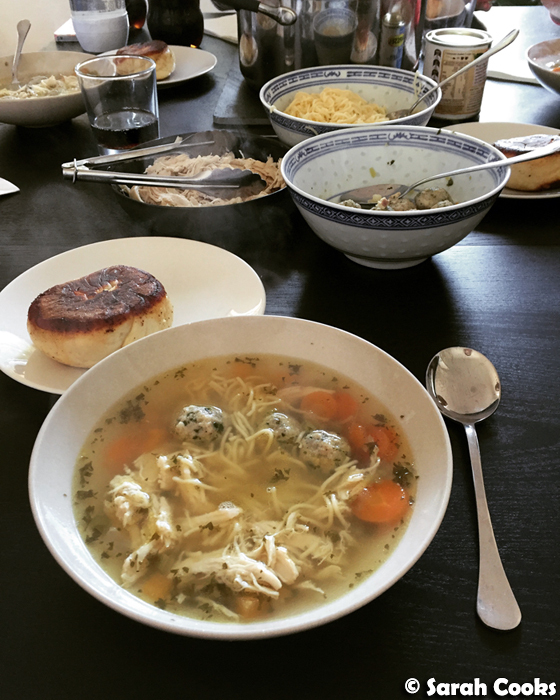 I'm sure you've got your own favourite chicken soup recipe, but I'm a big fan of Nigella's Praised Chicken (recipe online, and in her book Kitchen), for which you braise a whole chicken with a whole lotta vegetables and some herbs. It's so comforting and nourishing. Here's the fun part - the frying! You heat some oil in your pan, then pour over some hot water from a recently boiled kettle, sprinkle generously with table salt and gently place your Dampfnudeln inside. Warning: it will splatter and steam a lot! Be super careful! Get kids or pets out of the way! Open the window, get the exhaust fan on, and wear long sleeves! Once your Dampfnudeln are in the pan, clamp on the lid and cook over a medium high heat until the water is mostly evaporated. (This usually takes about 5 to 7 minutes, but you can hear when the water has evaporated - the steam sound stops and it starts to hiss a little). 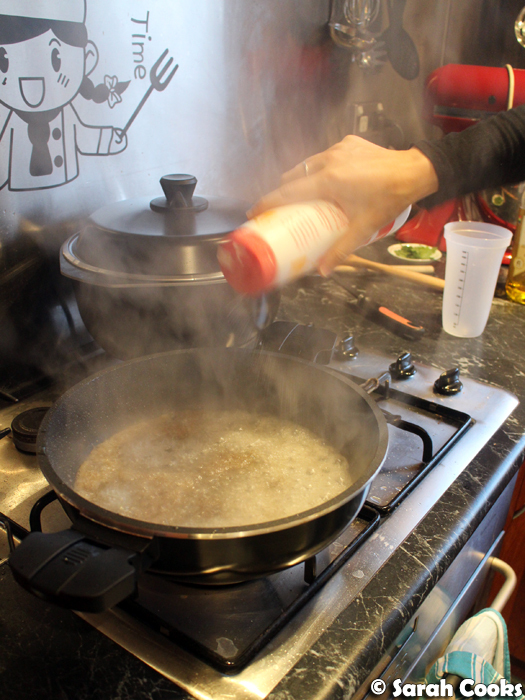 Then you remove the lid and allow the water to evaporate completely, ensuring the base is nice and crunchy. Normally this is where your Dampfnudeln-process ends, but Sandra's family likes a double salt crust (it's the best bit!) So for this, you lift up each Dampfnudel one by one, sprinkle some extra salt on the pan, flip the Dampfnudel over and fry it for a couple of minutes until both sides are gloriously crunchy and salty. Mix the flour, milk, yeast and the 5 grams salt in the bowl of a free-standing mixer fitted with the dough hook. Knead for 5-10 minutes medium speed, or until the dough is smooth and elastic. 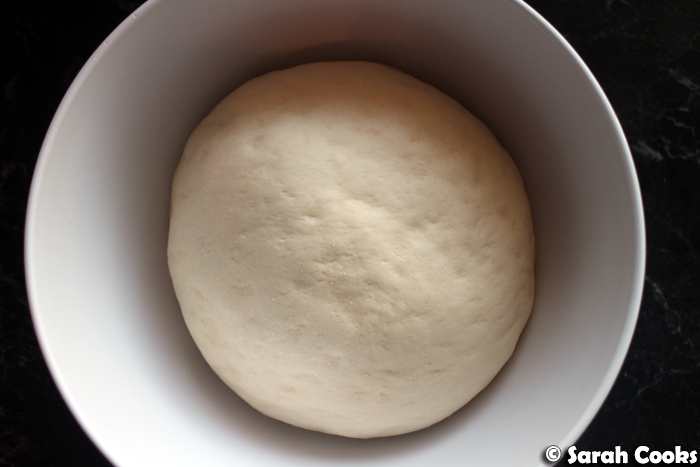 Form the dough into a ball, cover the bowl with clingfilm and allow to rise in a warm place for an hour, or until doubled in size. 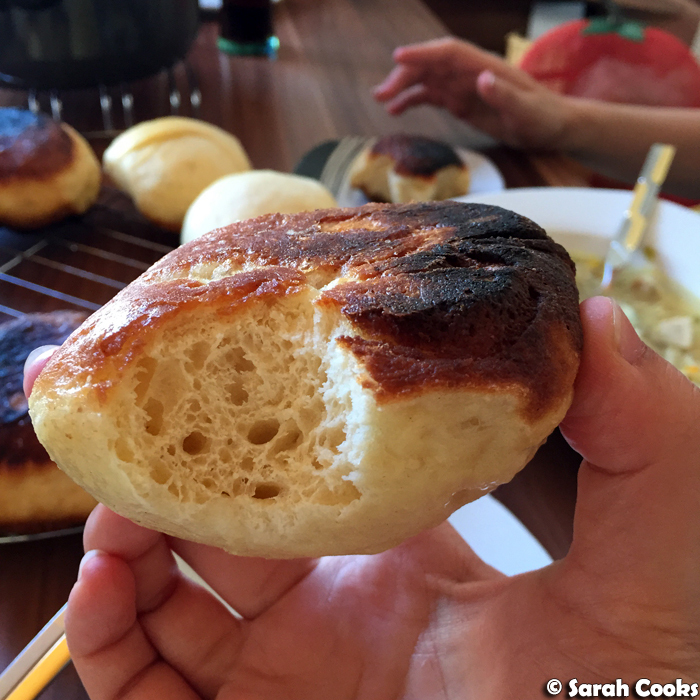 Punch the dough down to expel the gas. 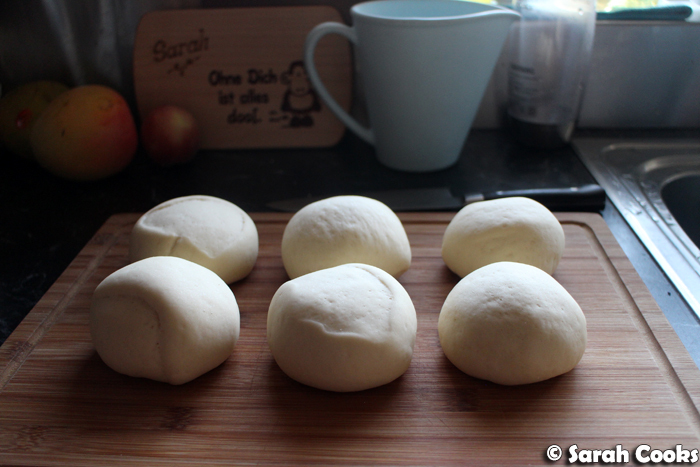 Divide the dough into 6 equal portions and roll into smooth balls. Place the balls on a board and allow to rise for 30 minutes. 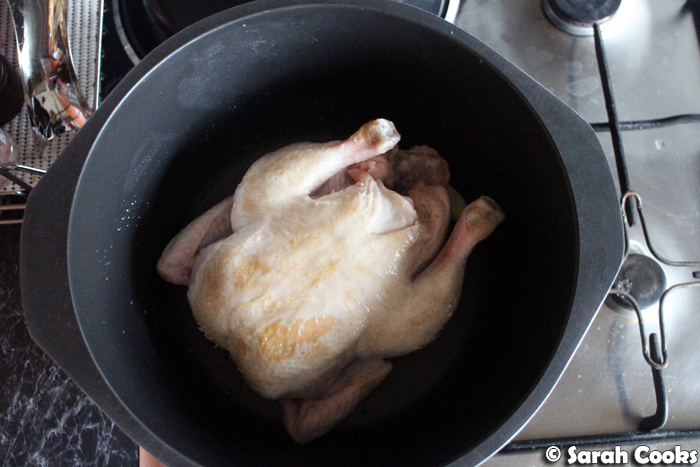 Heat a non-stick frypan with a tight-fitting lid over medium heat. Add 3 tablespoons vegetable oil and 130 millilitres water from the kettle to the pan. (Be careful, it will steam up and spit a lot!) 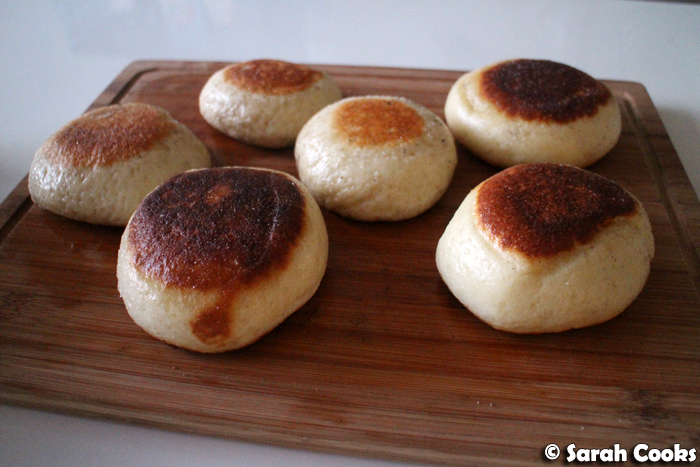 Sprinkle the base of the pan generously with salt, then place three of the rolls into the pan. 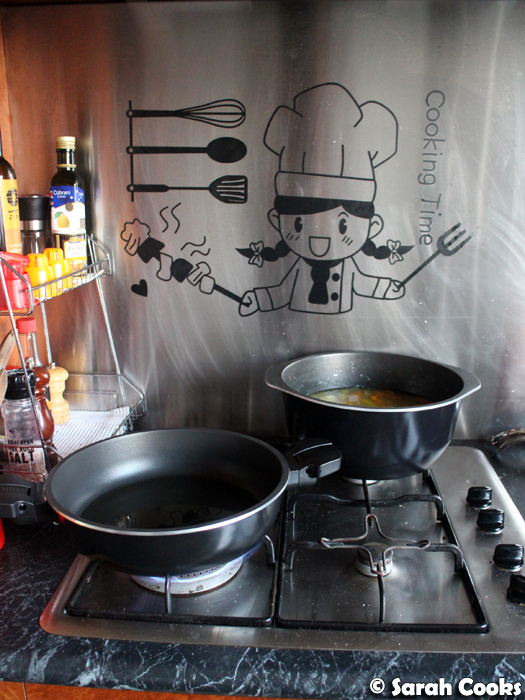 Clamp the lid on and allow to cook until the water is evaporated. (This will take about 7-10 minutes). Remove the lid and cook for a further 2 minutes. 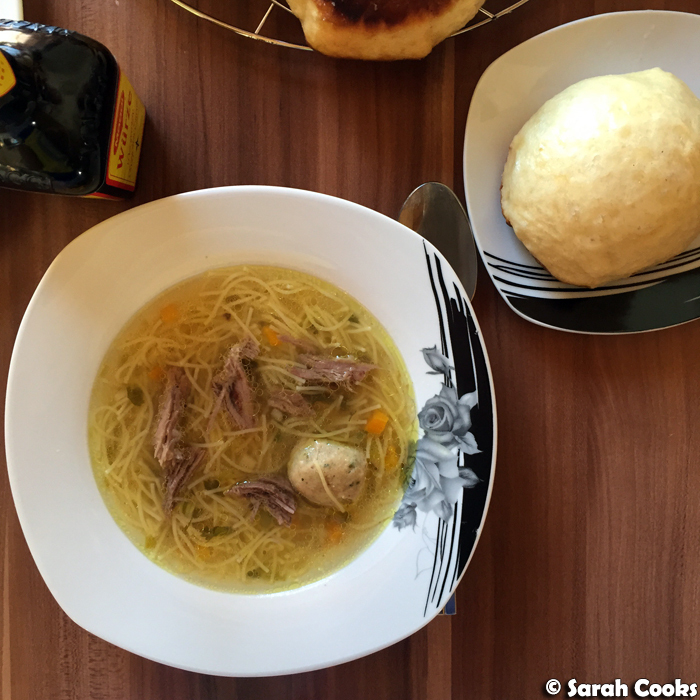 Remove the cooked Dampfnudeln to a waiting plate. If you'd like a double salt crust (highly recommended), once they're cooked, flip each Dampfnudel over, sprinkling the pan with extra salt before you place each Dampfnudel back down in the pan. Allow to cook for 2 minutes, or until crisp. Repeat the process with the remaining 3 Dampfnudel. Serve with a clear soup. Yum, these look delicious and I love the Bessemer!! All of them are delicious! And I want a bite from that Dampfnudel!